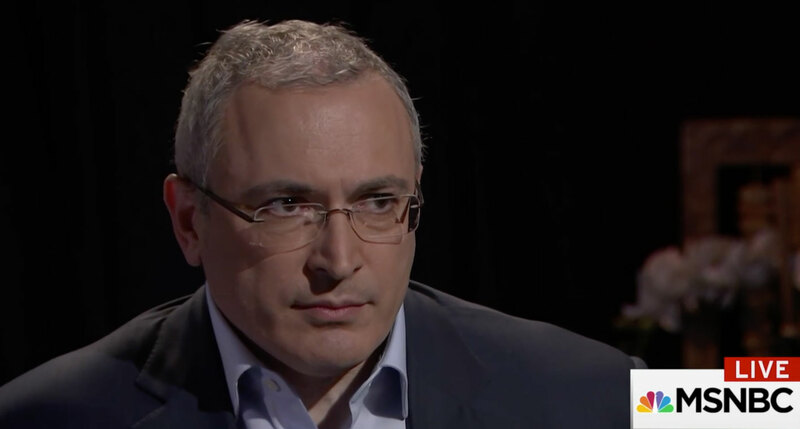 On Tuesday October 17 Mikhail Khodorkovsky took part in The Beat with Ari Melber on America’s MSNBC where the two discussed what it’s like to clash with Vladimir Putin, what the Russian president’s political future has in store, and what the real significance of Russian interference in the US elections was. 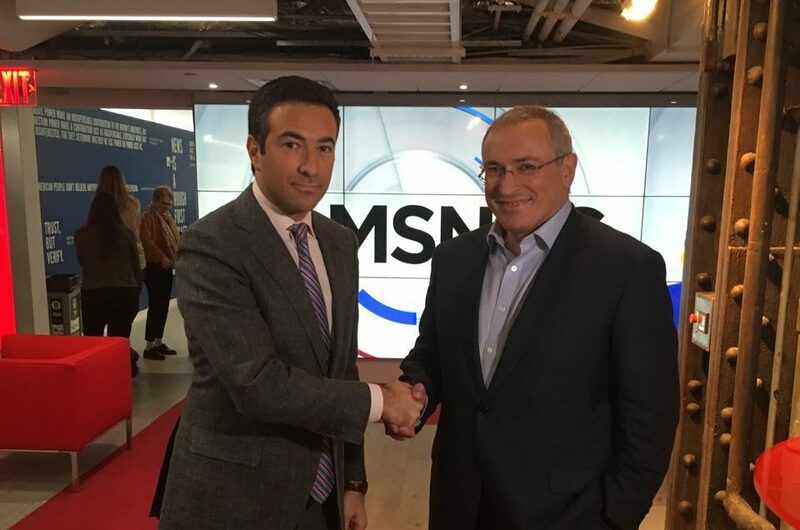 Ari Melber: Mikhail Khodorkovsky, thank you for joining me. What did you learn about Vladimir Putin in your clash with him? 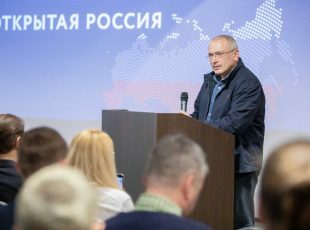 Mikhail Khodorkovsky: I learned that this is a man with a very particular view of life. A view typical of special services operatives or gangsters. It differs from regular people. If you show willingness to negotiate, it means you’re weak and must be squashed. Melber: He is now 65, Vladimir Putin, do you expect he will stay in power and die in office, or not? MBK: I don’t think even he knows the answer to that. I think he wants to leave office, but is afraid to because he doesn’t trust anyone. Melber: Should he face any potential charges after his time in office? MBK: No one can guarantee to him that it won’t happen. And if anyone does make such a guarantee, he won’t believe them. Melber: You had your life changed, your business career ended, all for what International Observer said was a “political persecution.” Are you now safe in exile with that behind you, or do you worry about something happening—anything? MBK: I could make my life safer by not getting involved in the sociopolitical life of my country. But then it wouldn’t be my life. I am involved, and I accept the risks that come with it. Melber: What would happen if you went back to Russia right now? MBK: I have been explicitly warned about that by the government. If I crossed the Russian border, I would be arrested and sentenced to life in prison. Melber: And do you view those as legitimate charges or, again, a political threat? MBK: That was conveyed to me in response to my question about returning home. And I doubt anyone has lingering questions about any detail of my case having anything to do with justice. Melber: Your history here runs deeps. Americans have started to pay more attention to Vladimir Putin just recently, as you know. Are you confident that Putin was behind the meddling in the U.S. election? MBK: I am almost convinced that Putin’s people have tried to influence the US election in some way. Whether that was done on his direct orders or someone was trying to—and succeeded in—giving it to Putin as a present, I don’t know. I’m not an insider. However, I think it’s very clear that it’s wrong to say that it was Russia that tried to meddle in the US election. Russian citizens care even less about the US elections than their own. There is a very small group in the Kremlin that has usurped power by taking the post of the president. Nobody elected this group. It exists above the Russian law. And if you see any gross violations of the Russian law by the Russian government, you can be certain that this is the handiwork of this small criminal network. Melber: Why did the Kremlin and these people prefer Trump over Clinton? Melber: Who is getting more out of the relationship between Trump and Putin? MBK: The truth is, I don’t know what their plan was. But in practice, both Trump and Putin have problems as a result. You know Trump’s problems better than I do. As for Putin, he needs America as his enemy. And now he has the difficult task of constantly explaining how, despite Trump being our man in the White House, America is still an enemy. I should say that the Kremlin propaganda has been up to the task, but it’s been tough going. Melber: Is Putin smarter than Trump? MBK: I don’t know Trump. Putin is a strong tactician, no doubt. And he’s more experienced than Trump. If they were to face off, I wouldn’t bet on Trump. However, America has something Putin doesn’t. And I’m not talking about the economy. Putin has a small criminal network behind him. A US president has a huge democratic apparatus behind him. To be sure, if a U.S. president severs ties with this apparatus, he will become weaker than Putin. But, as far as I know, the U.S. constitution exists to prevent severing ties with the democratic apparatus. Melber: So you’re optimistic about American democracy and the rule of law, even during the period where Americans feel this is being tested? MBK: America is one of the world’s foremost democracies. Consequently, America is usually the first to encounter problems that might arise in a democracy. And then it resolves these problems. This is your mission. Melber: Sergey Gorkov is a Russian banker. Americans heard about him because he met with Jared Kushner in December 2016. His bank said the meeting was about doing business with Kushner. The Trump administration said no, it was a government, diplomatic meeting. Years ago, Gorkov was also a former employee of yours. Would it be normal for him to mix private business and the Kremlin’s agenda to influence a U.S. official like Jared Kushner? MBK: When he worked for me, Gorkov was a fine employee who dealt with HR. I have no doubt that he wouldn’t do anything on his own behalf. He is a man who carries out orders. Melber: And his orders now come from the Russian government and Putin? MBK: His orders come from a lower level, I think. If there were any instructions, they came from the level of Kostin, the chairman of the board of VTB bank. Or from the level of Mr. Gref, which isn’t nearly as likely, despite the two of them being close. Melber: How do you interpret that the Russian bank says this is for business and the Trump administration and the U.S. government said it was for government? MBK: It’s difficult for me to interpret such a contradiction. However, it’s very possible that what your administration regards as a governmental issue, Russian representatives view as purely business. Although, in my experience, it’s typically the opposite. Melber: When you were prosecuted under the Putin administration, some of your employees gave testimony and cooperated, others became targets. I read Gorkov didn’t give public testimony but his career has excelled with the Russian government. Why is that? MBK: There were actually three groups of people. A very large group of people were persecuted. A very small group of people—only two, really—gave false testimony. But the vast majority of the company’s employees weren’t drawn into this process at all. Of course, this would be harder for a top employee like Sergey Gorkov. However, there’s no testimony from him anywhere in the case materials. Nor is there evidence anywhere that he tried to set anyone up. I’d rather not say anything bad about anyone without hard evidence. Melber: The FBI is currently investigating the meeting at Trump tower between senior officials with the campaign several other individuals including Russians. Names you may know like a lawyer, Natalia Veselnitskaya, a lobbyist, Rinat Akhmetshin, and Ike Kaveladze, who was representing the Agalarovs. Would any of those people normally be in a position to represent the Russian government or its interest? MBK: In a normal situation, no, of course not. Melber: And perhaps I asked the question the wrong way. But could they represent Russia’s interests? 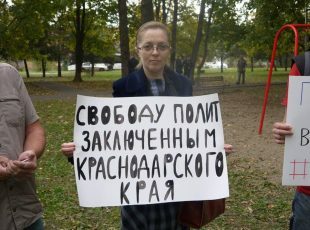 MBK: I wouldn’t find it at all unusual if, say, Mr. Chaika, Russia’s Prosecutor General, whom the people of Russia have accused of corruption, involvement with criminal organizations, and the like, based on a wealth of evidence and whose son is suspected by many in the Russian society of working directly with criminals and even putting out contracts on people…I wouldn’t find it at all surprising if he used an attorney he knew to propose some kind of deal to future influential persons in America. For his own personal interest—I have no doubt that he has considerable property within reach of the US government. And also because he would want to make himself useful to Vladimir Putin. At the same time, were he to decide to take such a step, he would get permission from Vladimir Putin beforehand. The reason I speak with such certainty is that Mr. Chaika is the type of person whose behavioral patterns I’ve been forced to study for nearly a decade. Melber: You mean the type of person that’s in a heavy Russian prison? Melber: Given your knowledge of how Putin’s government works, on the scale of 0, something is unfathomable to 10, a certainty, it happened, what number in your view do you give the theory that Putin did seek to collaborate and collude with the Trump campaign in the U.S. election? MBK: I would say 9 out of 10 that he personally and his inner circle attempted to cooperate. Whether or not that proposal was accepted, I would let the people responsible for investigating the matter answer that question. Melber: Can Putin lose the next presidential election next year? MBK: If there was to be an election in 2018 by some miracle, it is highly likely that Putin would lose. Instead, in 2018 we’re going to see a show called “Presidential Election.” It cannot be won, because it is a show. The show will go exactly as the producer has planned. Melber: We know something about that. Scripted television is what they call it here. Reality shows. MBK: And if something unexpected happens, you can always re-record. Melber: A few more quick questions before I let you go, and I appreciate you spending time with us. Maybe quick. What did you learn while you were in prison? MBK: The biggest thing that prison gave me was a different perception of time. When I say that something will happen “soon,” for me that means a decade. 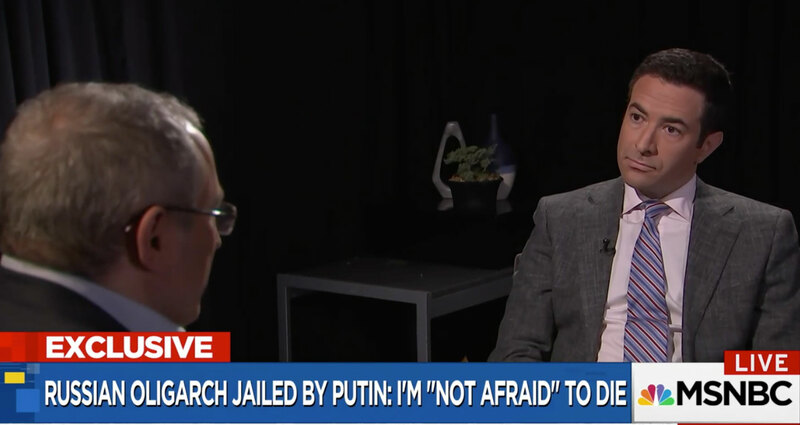 Melber: Were you afraid or did you ever think you might die in prison? MBK: We have a joke in our country. First, a person is stripped of all pleasures, and then asked: “Are you willing to give up your life?” So the person responds: “Of course! 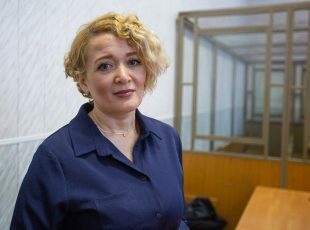 What do I want with this life?” The point is, life seems worth living far less inside a Russian prison than outside of it. And that is true both in how you perceive life, as well as how the prison administration treats it. Could I have been murdered? Certainly. I was knifed in the face while sleeping. Was I afraid of it? No. After the doctor stitched me up, I went right back to sleep. Melber: You said that was a Russian joke. With Russian jokes are we supposed to laugh or cry? MBK: With nearly all Russian jokes, you laugh through the tears. Melber: Reading your history, following your life, and you’ve been through a lot. Sitting with you here today you seem happy. Are you happy now? MBK: I am undoubtedly happy, though I fear admitting it. My family got me back. This is extremely rare of Russian prisoners. Many friends have stuck with me. And I have a goal that I wish to achieve in my lifetime. I want not just for Putin to no longer be president, but for the entire system in Russia to change so that another Putin could never come to power. I may not live to see this goal achieved, but I find it absolutely worth pursuing. Therefore, yes, I am happy. Melber: Last question. Having faced down Putin, served a prison time, gone into exile, lost much of your fortune, what do you want Russians to know now and what do you want Americans to know as they think more about Russia? MBK: I badly want my fellow countrymen to understand that the problem isn’t with Vladimir Putin per se, but with the system he represents. This is a system where a small group of criminals can dictate life to a vast country. On the other hand, I want Americans and Europeans to clearly understand that the lawlessness they sometimes see coming from Russia—that’s not Russia. Not only is that not the Russian society, it’s not even the Russian state. 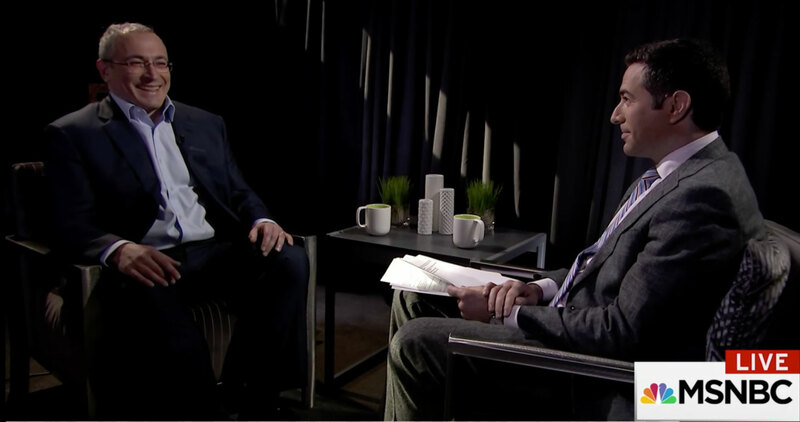 Melber: Mikhail Khodorkovsky. I really appreciate it. It’s very interesting, and I think people will be interested in what you have to say.